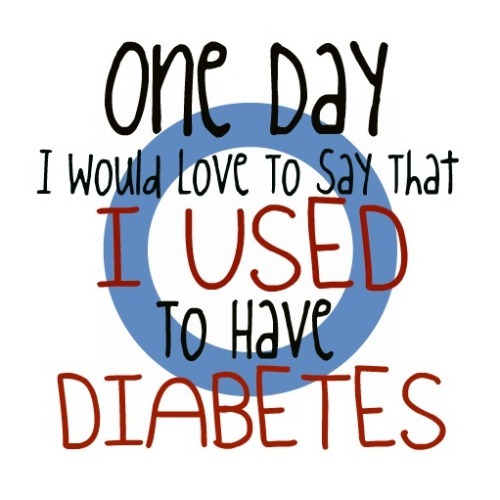 July | 2015 | Diabetes Doesn't Own me! What was supposed to be a fun hiking day, turned into a saturday filled with tears, hail and high blood sugar. About a month ago I planned a 10 mile round trip hike to Inspiration point with a new friend. I went to sleep early the night before, packed snacks, water and extra diabetes supplies and laid out a healthy breakfast. The hike started out perfect. It was warm and sunny. My blood sugar was good, I was feeling good. 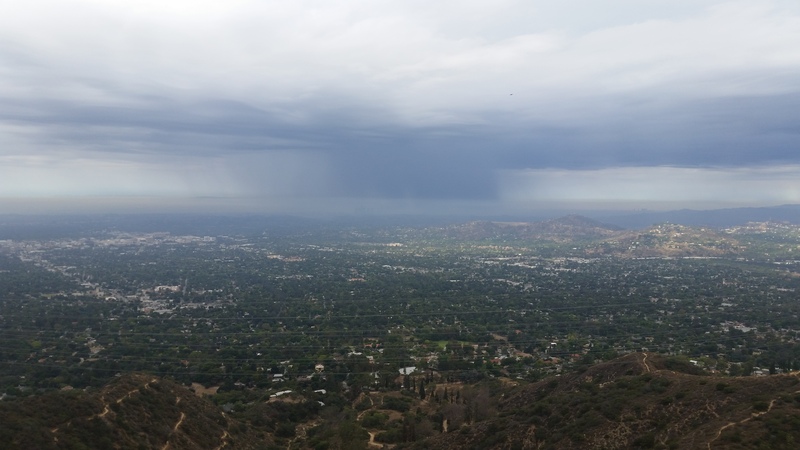 I got an amazing shot of a rainstorm over Los Angeles. It looked like the rain was going to miss us. By the time we saw the lightening get closer to the mountain, it was beginning to drizzle. We figured that we’d make it to the halfway point and decide if we wanted to go the whole way up to Inspiration point. It didn’t look so bad. If anything, we’d wait out the storm before continuing on. The higher up we got, the closer the lightening was. By the time we made it to Echo Mountain it was raining hard, windy, and freezing. A park ranger suggested that we head back down. At this point my blood sugar was on its own steady climb up. At the base of the mountain my sugar was 206. By the time we got to the top it was over 300. I cancelled my 50% temp basal and gave a correction. We kept stopping along the trail as the rain got heavier and heavier. Then, for a brief couple minutes it started to hail. In July. In Pasadena. And every time I looked at my sensor my blood sugar was higher. By the time we finally got back to the car my sugar was over 400. I felt terrible, I was soaked to the bone and all I wanted to do was sleep. As soon as it starts to rain, everyone in Los Angeles loses their minds. Nobody knows how to drive. People freak out because idiots drive other idiots off the road. It took forever, but i finally got home. I drove as slow as possible and felt like someone was twisting my stomach into knots from the inside the entire way. Somewhere along the way I had to stop the car and throw up. My wonderful husband helped me inside and got me a nice cold diet ginger ale to sip on. I changed my pump, gave a correction and fell asleep. A couple hours later we decided to get ready for the Red Sox/Angels game that night. We already had tickets and I was beginning to feel better. Unfortunately, because of the rain, it took us almost 2 hours to get there and we were about 45 minutes late to the game. By the time we finally got food, sat down and could relax, there were only 3 innings left. We stayed until the very end and were having a wonderful time…. until we walked to the parking lot and discovered that someone had stolen my car. I guess things can always get worse…. I decided to see what all the hype was about and finally make cauliflower crust pizza. I’ve been meaning to try this recipe for weeks. 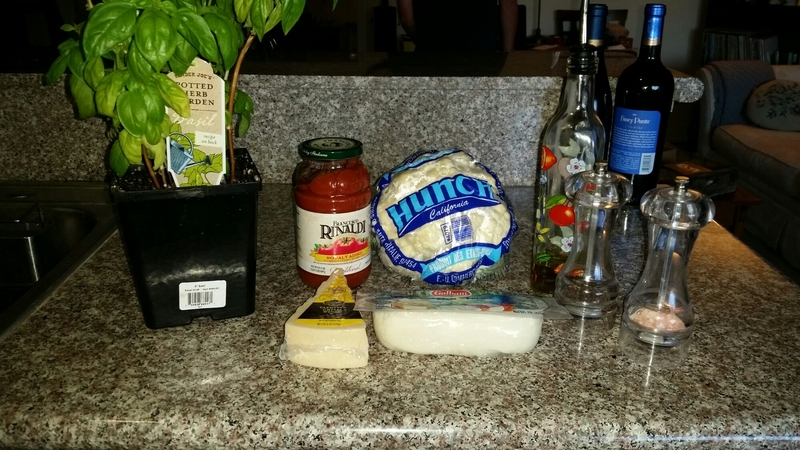 So yesterday I got cauliflower, mozzarella, parmesan, and tomato sauce and invited my neighbors over for moral support. We already had a backup plan in case the meal turned out to be a total bust. The recipe called for rosemary and oregano for the crust, but I used fresh basil from the one plant I haven’t killed in my apartment yet. Looks like I need to restock my salt and pepper….The wine was very crucial in the cooking process! My first step was to shred the mozz. 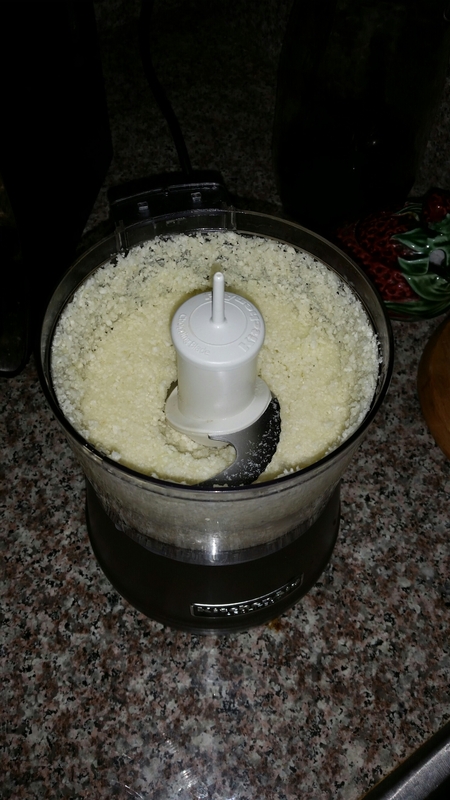 I did it the same way the Layla (blogger who posted the recipe) did it and shredded it in my food processor. I don’t think I’m ever going to use a cheese grater again. Next was the cauliflower. It was probably the most time consuming part of the recipe because I got such a large head of cauliflower and I have a smallish food processor. About halfway through I realized I had been hitting the chop button instead of the puree button. As I cleaned up the sink and got the egg, salt, garlic powder and 1/4 cup of each cheese, my neighbor Liz squeezed all the liquid out of the pureed cauliflower. I mixed everything together and realized I had forgotten to preheat the oven to 500….oops. I didn’t have any parchment paper and since I don’t eat regular pizza I didn’t have a pizza stone either. But we made do with a cookie sheet and aluminum foil. I sprayed the foil with Pam and pressed the dough into an oval. About 40 minutes later we had a delicious, misshapen crust. 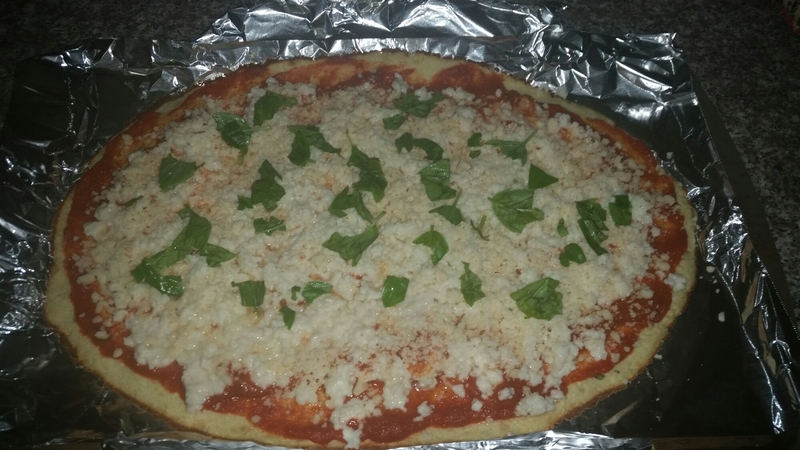 Once it had browned in the oven, I sprinkled with mozz, parm, and fresh basil. We turned on the broiler and put it back in the oven for 4 minutes to get the cheese nice and melty. Around this time Sean and Liz’s husband, Federico, got back from the Italian restaurant around the corner with meatballs, garlic bread and an actual slice of real pizza (Sean’s idea-unbelievable). The apartment smelled amazing and the pizza was ready to come out of the oven. 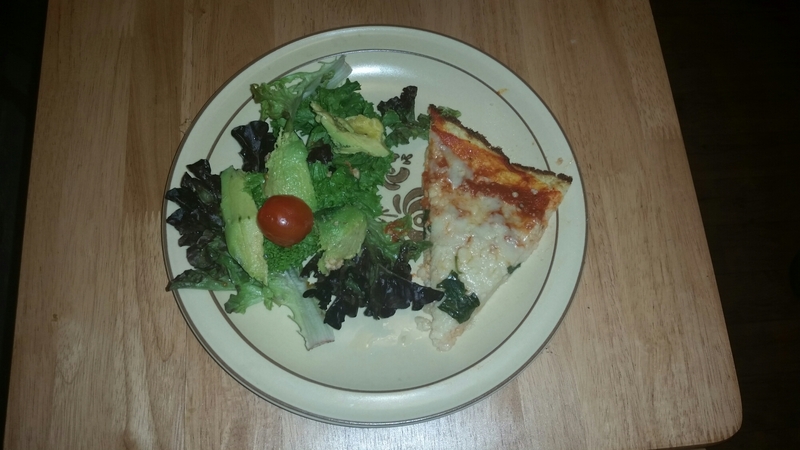 We all served salad and got a slice of the ‘faux’ pizza. The real Italian food was on standby. Liz took the first bite and said what we all were thinking, ‘It’s good, but it tastes like cauliflower, sauce and cheese.’ After we stopped laughing, we ate the rest of the “pizza” and the Italian meatballs. I wouldn’t say this recipe is a bust, but if you’re expecting it to taste like the real thing… well it doesn’t. Sean’s biggest complaint was that it had no pepperoni. I’ll probably be making this again, my blood sugar hovered around 100 throughout the night and into the next morning. But next time, I’m adding toppings! Now that I’m drinking Shakeology everyday again, my blood sugars have started leveling off again. This week it’s been hard to squeeze in workouts, but I’m managing to set aside at least 30 minutes a day. The best is when I have the time to ride my bike to get groceries. It’s even better when I can go for a long, challenging hike. I’ve noticed that out of everything I do to work out, hiking is the best for my blood sugar. As long as I keep an eye on what my sensor says during and after the hike and adjust my basal rate as necessary. I’m looking forward to hiking with a new friend on Saturday! Last night, the last thing I wanted to do was cook. I had planned early on to make a dinner plan for the week, but couldn’t find the time for that. So when I got home from work, I looked in the fridge and groaned. Fortunately, the hubby came home just before I had given up all together and ordered take-out. We took ground beef, veggies, tomato sauce and pasta and whipped up a delicious meal. I only had a few pieces of penne and loaded up on the broccoli. My blood sugars started rising only after I ate blueberries with whipped cream 🙂 That’s one of my favorite things about Sean, he can create something delicious (albeit many times extremely unusual) with almost nothing in the fridge. Hopefully today I’ll have more time to go grocery shopping! As much as I love routine and structure, sometime it’s nice to mix things up. I celebrated my second anniversary with my hubby last night. We went to an amazing restaurant on the water. Originally, I was concerned that my blood sugar would spike. I’ve never been great at estimating carbs in restaurant food. But I didn’t spike as high as I thought I would. I went up to about 250 and hovered around there a bit before coming back down this morning. I did have bread (who could resist!! ), and I bloused for my meal about 30 min before we started eating. I started to go low (92 and dropping) right as our appetizers arrived. I also tried to eat low glycemic index foods. I had salad, ahi tuna, calamari, and a petit filet with a side of snap peas. We didn’t get dessert, although all of them sounded delicious. I also didn’t eat everything off my plate, so I didn’t leave the restaurant feeling like I overdid it. I know my blood sugars aren’t going to be perfect everyday. Hi’s are a part of life, but it is frustrating when my number gets hi and stays hi no matter what I do. I ate the same foods, checked my blood and bloused like I’ve been doing but for the past couple nights, my sugar wont go below 250. I changed my site, and then changed it again but my numbers still see-saw. And then I realized that I haven’t had Shakeology in about 3 days. My secret weapon to stability. I always go on and on to whoever will listen about how wonderful Shakeology is and how much it has helped me. How could I have completely forgotten about it? I’m staying positive because I know that I’ll always have good days and bad days. Good weeks, bad weeks. They’re all learning experiences. For instance, I’ve re-discovered how crucial Shakeology is to a lower a1c. I’m not forgetting my shake tomorrow. I’m the first to admit that I spend way too much time on Pinterest. It’s the best way to find creative recipes, doable DIY projects and endless inspiration. I wanted to make something summery for dinner with all the fresh vegetables I had in the fridge. My plan was fresh, grilled chicken kabobs with rice. I had zucchini, mushrooms, tomatoes and chicken, oil, salt and pepper and seasoning. My only drawback is that when I’ve made kabobs in the past, the veggies never come out quite right. I never want to overcook the protein so the vegetables are either overcooked or undercooked. I found a pin for the best ‘fool proof’ recipe for kabobs. Instead of mixing everything on the skewers, put all of one food on each. So I had 2 filled with zucchini, 2 with mushrooms, 4 with chicken and 4 with tomatoes. Everything cooks at different times so everything was cooked to perfection. My only regret is not taking pictures while I was doing it. Next time I’ll remember! The best part is that since I skipped the rice and loaded up on veggies, my blood sugar stayed steady at 150 (until I had fro yo and had to correct…). I still haven’t made cauliflower crust pizza, and there are a lot of recipes to try on my list! Before my delicious meal, I had an awesome workout with a great friend. I forgot how much I loved the track! I went with my neighbor to run and to do the stairs. We stayed about 45 minutes and didn’t stop moving the entire time. I love working out with a friend because the time just slips away. As much as I love working out, I can get a bit lazy when I exercise by myself. Having a buddy there with me holds me accountable! She is working up to a 5k, I’m working up to a half marathon. No matter the level it doesn’t make the goal as daunting when you’re experiencing it with someone else. I just had my monthly endo appointment and I can honestly say it was the best one I’ve had in years. In just the few weeks I’ve started using the minimed cgm again my blood sugars have been amazing! Doc Peters said that she thought she was looking at someone else’s chart. The real reason I have been doing so well I think is because I’m checking my blood more often. That was the first thing Doc Peters had me doing when I first started seeing her a year and a half ago. I wasn’t even checking once a day, but by checking 3 times a day and not changing anything else, it brought my sugars down (to an average of 280) immediately. The more I check my blood, the more I correct, and since the minimed cgm isn’t as accurate as my old dexcom, I never bolus or correct off the sensor. It might seem that that would make my control worse, but now I’m almost forced to check my blood. That, combined with my diabetes kit sidekick, I have everything I need. Eating better foods keeps my blood sugars from spiking and that keeps me from getting frustrated and giving up too quickly. I LOVE seeing a steady line around 150. It rarely goes over 200. I have more energy so I look forward to exercising. 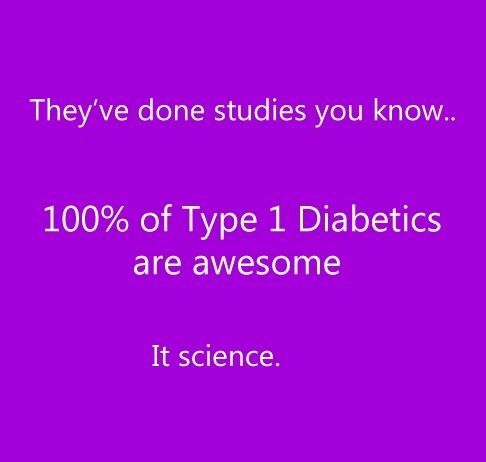 Everything is coming together and helping me feel (a little bit more) in control of my diabetes. I don’t want to get too preachy. There are things that bring my BS up. 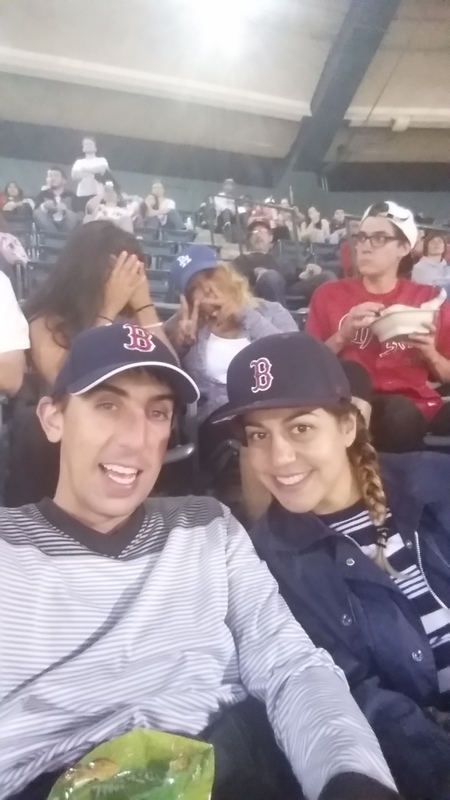 I went to a Dodgers game last night and sat in the all you can eat pavilion seats. 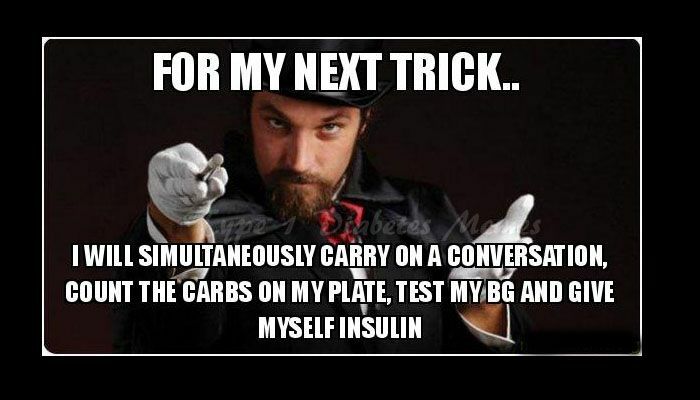 Even giving insulin 30 minutes before I started eating didn’t keep my sugar from going over 300. But this time I was prepared, I bloused, I corrected, and the next morning woke up at 140. So I’m busted. Doc Peters knows what I’m capable of. And she doesn’t expect any less from here on out. I don’t expect any less from myself either.